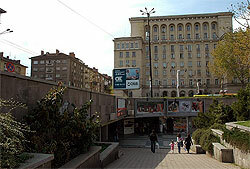 Oborishte (a prime area) is in Central Sofia. It has a lot of early 20th century buildings, housing government ministries and institutions such as the Council of Ministers, the Ministry of Regional and Public Development, the Ministry of Education, the Social Ministry, the Energetics Committee, the Capital Municipality, the State Archive Bureau, the Parliament building, and several foreign embassies. Most people who live here work for the government. Oborishte’s residential areas are quite upscale; the most prestigious ones are along GS Rakovski Street, Narodno Sabranie Square, and Tsar Osvoboditel Boulevard. There are several schools in Oborishte, including the National Academy of Arts, the State Academy of Music, and the Military Academy Georgi Sava Rakovski. Tsar Osvoboditel Boulevard is one of the city’s most prestigious addresses. The Boulevard’s central section is covered in yellow Viennese cobblestone—a picturesque sight in the middle of urban Sofia. It is home to important institutions; the former Royal Palace (now housing the National Art Gallery and the National Ethnographic Museum), the National Assembly of Bulgaria, and the Sofia University rectorate. A Russian Orthodox church, the Church of St Nicholas the Miracle Worker, is also on this street. It was built in the late 19th century for the Russian expatriates who lived and worked in Sofia, and so is also sometimes called the Russian Church.